ctBRAF Mutation Detection Kit | EntroGen, Inc.
Over 50% of metastatic melanomas harbor a BRAF activating mutation in codon 600. Testing for these mutations in tumor tissue is routinely done to guide therapy. Recent studies have demonstrated the utility of detecting BRAF mutations in cell-free DNA isolated from plasma of patients diagnosed with melanoma to supplement or replace testing in tissue. Furthermore, mutations in cell-free DNA have been shown to correlate with disease progression when used to monitor treatment response over the course of therapy. 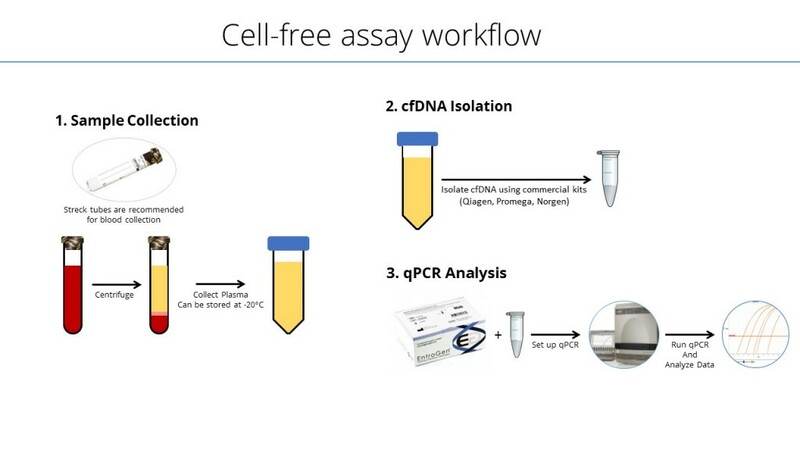 EntroGen has developed a non-invasive, ultra-sensitive real-time PCR test for detection of BRAF V600 mutations in cell-free DNA isolated from plasma. Analytical performance studies have shown that the test can detect single digit copy numbers of the BRAF variant and requires low amount of DNA (2ng) per sample. The test detects BRAF V600E, V600E2, V600K and V600D mutations. The ctBRAF Mutation Detection Kit requires a real-time PCR instrument capable of detecting FAM and VIC fluorescent probes simultaneously.